The Platinum Classic fountain pen ink are produced in their traditional method proven over time. This process involves a time consuming process of mixing dye ink. The result is a ink color that is bright but gradually darkens as it dries. The ink is also highly water resistantand suitable for permanent preservation. The Pleatinum Classic ink has been specifically designed for use in fountain pens with an emphasis on shading creating rich deep writing. 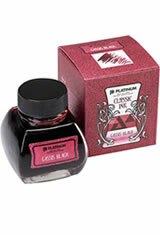 The Platinum Classic (60ml) Fountain Pen Ink usually ships within 1 business day unless otherwise specified. Each Platinum Classic (60ml) Fountain Pen Ink we sell is guaranteed to be genuine, authentic and will arrive brand new & unused! Very good behaving ink. Lovely color. A maroon with a black tint to it. Write red and dries with this darker blackish red. Very nice. As others have noted this ink starts out bright cherry red. However, it begins to "go black" fairly quickly as it dries. Excellent shading, no feathering. Because this is my first iron gall ink I have not tried it in my high end fps until I see if it stains too much I have it in a TWSBI Diamond 580 with 1.1 stub nib. It writes very smoothly. Classic Black is a Beautiful red going onto the page, eventually shifts to dry in black. Pretty pairing for the Platinum Balance Pen in Red Wine. Strange and freaky iron gall ink, but that is why I love it! Pretty red display in the classic retro look ink well bottle. First Platinum ink I have tried but will definitely be getting more! This ink beatifully transitions from purple to deep purplish black as it dries. It has a nice fluidity and gives your writing a special flair. Pen Chalet delivered my order so quickly! Awesome service, awesome product! This ink is wonderful stuff. It's very permanent, so be careful. But it goes on the page as a lavender, but then dries to a deep purple with some excellent shading. I was a new comer to pigmented inks and dubious since they require a bit more nib cleaning, but this is an excellent product. I've used it in stubs and in a fine nib; it shades nicely. These iron galls are amazing. Good colors, and I trust them in all except some of my vintage esterbrooks. Writes smoothly with a luscious bright red-purple and dries to a pleasing dark red with the characteristic dark oxide finish of iron gall inks. No sheen. Waterfast once dried and oxidized. Dries in 20-30s at ambient 28C, tropical humidity. Great traditional iron gall ink. Writes dry but has excellent performance and permanence. Great color variation as the ink oxidizes. Will they be waterproof, as with Platinum Carbon black, Sepia, Rose, and Blue black? The Platinum Classic ink is more like their dye ink and not their pigmented inks. The Classic ink is highly water resistant and suitable for permanent preservation.